"Do I dare to eat a peach?" T.S. Eliot lives! Starting the new year with a bang and not a whimper here's to T.S. Eliot! This week marks the 50th anniversary of Eliot's death in 1965; he lived to see the Beatles' first LP, but not a man on the moon. He also lived to see himself an esteemed figure, winner of the Nobel Prize in Literature, which he accepted, he said in his speech, "not on my own merits, but as a symbol, for a time, of the significance of poetry". 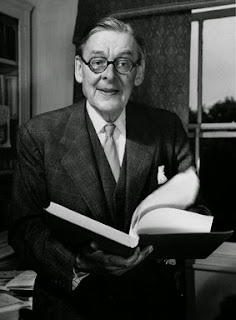 Of course, that "for a time" was excessively modest, as is demonstrated by the flurry of activity the anniversary is engendering: readings, productions, broadcasts, a Mass or two, a social media shout-out with his own hashtag of #TSEliot, and more.